Tender, green peas appear in all sorts of spring dishes, from pasta primavera and stir-fries to salads. If you haven’t tried sweet, crisp sugar snap peas yet, you’re in for a real treat. 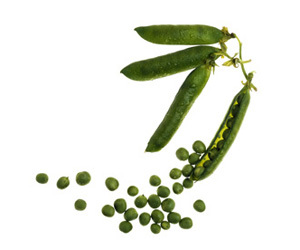 Sugar snaps are a cross between traditional English peas and snow peas. Available fresh in the spring and fall (and frozen year-round), sugar snap peas are entirely edible, "pod and all," and are equally delicious raw or cooked. They also make elegant appetizers, whether stuffed with cream cheese or used as crudités with creamy dips, and they're ideal for all kinds of Asian-style skillet dishes with other spring produce, such as asparagus and green onions. Select plump, crisp pods that are bright green with no signs of yellowing. Prepare fresh sugar snaps as soon as possible after purchasing for the sweetest flavor. Refrigerate in a plastic bag for up to 3 days. Some fresh sugar snap peas are available stringless, which means they are ready to use immediately after washing. Otherwise, snap off the stem end of each pea pod, pulling down the length of the pod to remove any tough strings. Sugar snap peas are usually eaten whole and are delicious raw or cooked. If cooking, steam, simmer or stir-fry briefly-only for a minute or two-to retain their crispness, color and flavor. Serve raw sugar snap peas with your favorite KRAFT Salad Dressing as a dip. Toss raw sugar snaps into your favorite green salad. Add to your favorite stir-fry or pasta dish.